This list will grow as I acquire and read more books. This should be the first book you get as a rocketeer. 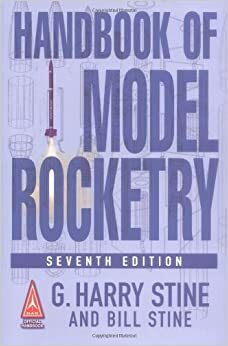 Written originally by the late G. Harry Stine, one of the founding fathers of model rocketry, it is now up to its seventh edition, with updates by Stine's son Bill. This book covers all the basic topics of model rocketry - building, safety, aerodynamics, staging, clusters, motors... It goes into some of the mathematics of rocket science and gives a terrific grounding in what you need to know to better understand how rockets work and how to get best results from them. I've talked about this book many times on this blog. It is published by MakerMedia, the same company that publishes the DIY magazine Make. 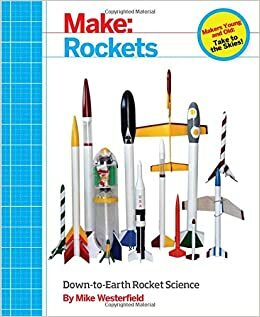 The author starts you out making match-stick rockets and air rockets out of soda straws, and goes on to cover the basics of rocketry, much of which is similar to what you'll find in The Handbook. But he guides you through the construction of several original designs, using component parts, rather than kits. He shows how to make your own ground support equipment, including launch pads and launch controllers - both single and multiple-pad versions, if you want to make something larger for a club or school project. By the end of the book, you should feel confident that you can design and build your own rockets, if you wish to, and don't necessarily need to stick with buying kits. The author is working on a second book, Make: High Power Rockets, due out some time in early 2016. Model Rocket Design and Construction is on my to-read list. And I'll have to check out the Topics In Advanced Model Rocketry. What about modern high power rocketry 2? That's a pretty good book. I'd consider it one of the best out there for rocketry. I guess I need to update this page. I hadn't read Modern High Power Rocketry 2 when I last edited the reading list, but I have recently. I'll add it soon. Also, be on the lookout for a new book, coming hopefully soon. Mike Westerfield is working on Make: High Power Rockets. It will be nice to add a new book to the library.